If I had to use an adjective to describe how I felt in the last few months is simply tired. And I don’t mean physically tired as if I was training for the olympics or as a new mom who hasn’t slept in months. No. I’m just mentally tired. I have a nice job, a nice life, everything is peachy but somehow I feel like trying to fit a pair of pants which are 2 size smaller (and this is both a metaphore and real life since I gained a lot of weight in the last year or two). It’s exhausting. I try to think positive, I try to enjoy what I have and the little things, but deep inside I still feel trapped in a life that doesn’t fit me and I don’t know how to fix it. Disclaimer: I usually don’t talk much about myself on this blog but hey, it’s still my blog and it’s not like anyone is reading it anyway so what the hell. So… Some days I feel torn between wanting to cook something nice and not having the mental energy to do it. So I re-invented a classic: Spaghetti aglio, olio e peperoncino (garlic, oil and chili pepper). This dish is a classic for a reason, it’s amazingly easy and stunningly delicious. Every time it blows my mind how can 3 simple basic ingredients when mixed and cooked together create such a deep and intense flavour. I always seen cooks on tv doing confit tomatoes but I never did it before so I decided to give it a try. But since long recipes that takes hours usually are not my biggest strenght (simply because I forget to start coking on time – the only exception is my Tuscan Ragù because I mentally prepare days in advance), I quickly oven roasted the tomatoes and the result blew my mind! Cherry tomatoed are particularly indicated for this because of their intense flavour and sweetness, but I tried it with many tomato varieties and it’s always a nice result. You can either roast them at hight temperature for 10-15 minutes or if you’re in a hurry put them under the grill so they caramelize nicely in as quickly as 5 minutes. Roasting in the oven makes the cherry tomatoes soft and incredibly flavorful. In each bite you can taste sweet, acid, salty and bitter from the caramelization. It’s a multisensorial experience. Okay, maybe I’m selling it too much but you absolutely need to try this and soon you’ll be adding roasted cherry tomatoes to every dish! 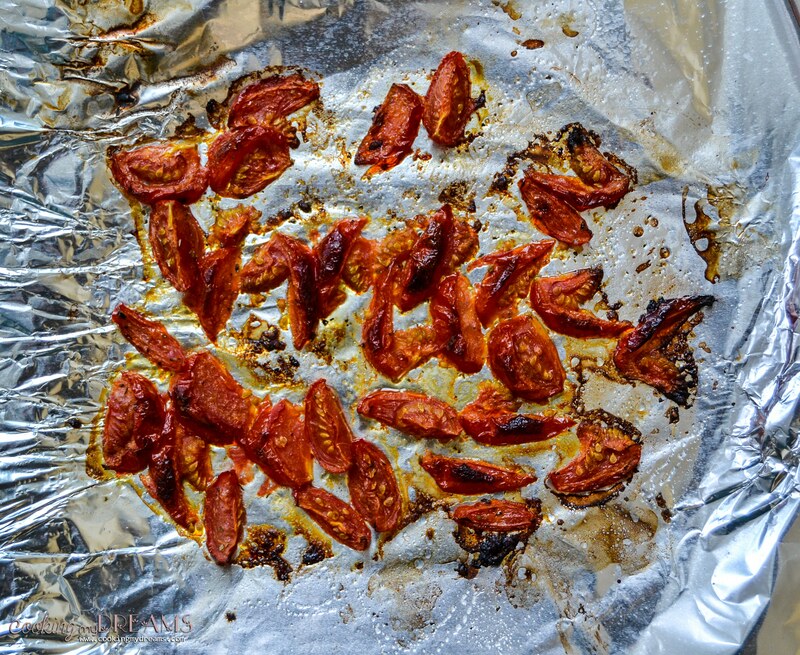 Spread the tomatoes on a sheet pan over parchment paper or aluminum foil, then drizzle with olive oil, sprinkle a little bit of sugar, then add the salt and some chilli pepper flakes. Toss with your hands to coat them well, then spread them again and put in a preheated oven at 220°C (430°F) on the top rack. Toss the spaghetti in the boiling water and after a few seconds mix with a fork or tongs so they don't stick together. Add the olive oil in a large pan with the garlic and fry at low heat so the garlic will cook but not burn. If it browns too quickly, remove from the heat for a little bit so the oil will cool down. When the tomatoes are caramelized, take them out of the oven (if instead it takes too long, put them under the grill for a few minutes). Remove the pan with oil from the heat, drain the pasta and add it to the pan (be careful, if the oil is too hot the water drops will "explode" at contact and will splatter all over). Add the chilli pepper flakes and toss the pasta well so it gets nice and oily. Serve with the roasted tomatoes on top, some shredded basil and grated Pecorino cheese. I like to serve the garlic as well with the pasta because if cooked properly it will become mild and sweet in flavour. But you can choose to serve it or not, some people don't like garlic that much!